Congratulations to Mike, seen here (on the left). He’s gone one up from his recent European success by collecting a Gold Team medal from the Veteran Fencing World Championships. Mike was selected by GBR on basis of his performance in the 2016 GBR National Veterans Champs where he was placed No 1 in the Men’s Foil over 70 years category .This No 1 ranking gave selection to the over 190+ years European Championships Veterans Men’s Foil team event held in Gillingham , Kent in May this year. 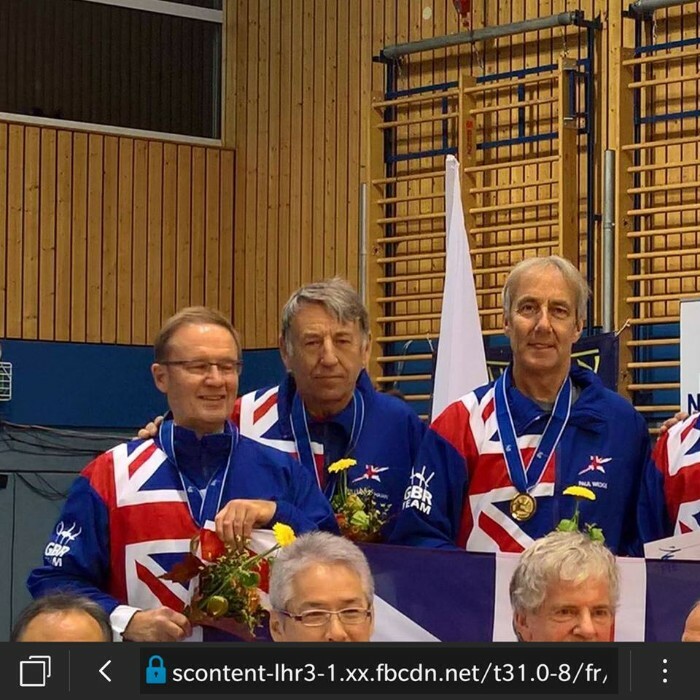 The 3 man team require 2 fencers in the 60 to 69 age category and 1 fencer has to be in the 70 to 79 age category .The GBR team beat Germany 5-0 to win the Europeans. At Stralsund , a Hanseatic city on the Baltic , there were 10 countries entered in the 150+ Men’s Foil team event: Japan, France, Russia, Italy, USA, Germany, Hungary, Australia, Canada & GBR. The team has to have a fencer in the 50 to 59 age, 60 to 69 age and also 70 to 79 age .The GBR team went with 6 members in total to allow each age category to have a reserve fencer .The GBR team beat Hungary & France in the first round pools . They then beat Australia 30-12 to go forward to meet Germany who were defeated 30-18 . The final of Japan v GBR resulted in a GBR win 30-24 for the team .